This tour fills an important need in the study of the Civil War—a most welcome addition to the Ambrose offerings! We are excited to offer you an exclusive new Civil War Tour that explores the rivers and ridges from Atlanta to Chattanooga to Nashville and the battles that raged there. In the Western Theatre of the American Civil War, over 200 miles of the Western & Atlantic RR pierced the South like a dagger, plunging into the Confederate heartland of Tennessee and Georgia. After the fall of Nashville in February 1862, the Union converted Tennessee’s capital city into a huge supply depot. 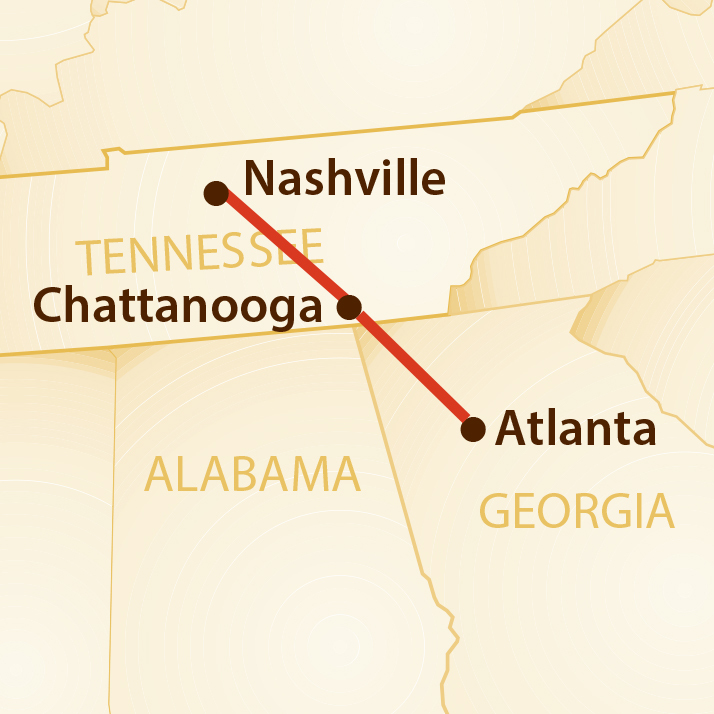 Then, using Nashville as a base, Federal armies probed deeper into the South, following the rails over the magnificent and challenging landscape from Nashville, through Chattanooga, to Atlanta. The mountains and rivers over which the rails ran soon became crucial battlegrounds for control of the deep South. This touring adventure will study the military campaigns and strategy of both sides, while delving into the minds of the leaders who were willing to sacrifice their lives and property for their countries. The Atlanta Campaign: We begin our study of the struggle for control of this crucial Southern city. The many pivotal battles fought in this region give us an appreciation for the commanders and men on both sides as well as how the rivers, rails and mountains came into play. Chattanooga, Chickamauga, Lookout Mountain: The hard-fought battle of Chickamauga was a Confederate victory, but the Union army returned under U.S. Grant to capture Chattanooga. We discuss the strategies and tactics employed by both sides and visit specific sites such as Brown's Ferry and scenic Lookout Mountain for the "Battle above the Clouds." Stone's River/Murfreesboro: The New Year of 1863 opened with the battle that shocked the nation with its destruction as Braxton Bragg hurled his Confederate Army of Tennessee against William Rosecrans' Army of the Cumberland. Franklin: Confederate General John Bell Hood went on the offensive pushing north and hoping to defeat the Union army in Tennessee and march to the Ohio River—and beyond. His aggressive pursuit and attack on John Schofield's positions cost the South six generals and a shattered army. Guests arrange to arrive in Atlanta and meet at our hotel for a welcome reception and dinner. Our historian will provide an overview of the tour. The Great Locomotive Chase. We then go to the Kennesaw House (the Marietta Museum of History) before going to the Kennesaw Mountain National Military Park. This afternoon we visit the Southern Museum of Civil War and Locomotive History where we learn more about the raid and see the restored locomotive, The General. We continue our study of the Atlanta campaign at Allatoona Pass and the bridge over the Etowah River that Confederate General Joseph E. Johnston burned. We then travel to Kingston where the Andrews Raid plan unraveled, and where General William Tecumseh Sherman encamped and planned his “March to the Sea.” After lunch in charming Adairsville, we visit key sites of the campaign in Resaca, Dalton and Ringgold, Georgia. We end the day at our hotel in Chattanooga. We begin our day at Chickamauga National Military Park. The battle was a costly victory for the Confederates. Union Colonel John T. Wilder described it as, two armies mauling each other “like two wild beasts, and each fought as long as it could stand up in a knock-down and drag-out encounter.” We study all the key aspects of the battle in which General George Thomas earned the sobriquet, “Rock of Chickamauga” for covering the Union retreat. We start our study of the Chattanooga campaign in front of the HQ site of General Thomas where U.S. Grant arrived to assume command in late October 1863. Afterwards we ascend Lookout Mountain, one of the most scenic spots in the region. The “Battle Above the Clouds” was fought here, and the mountain crest affords us spectacular views of the city of Chattanooga, the Tennessee River, the Wauhatchie Valley, and Brown’s Ferry. This afternoon we go to the rarely-viewed site of the fight at Brown’s Ferry, then to the Wauhatchie battle site, Fort Wood, South Chickamauga Creek, Orchard Knob, and Missionary Ridge. This morning we travel 90 miles to Murfreesboro, TN. Here was fought the critical Battle of Stones River, the brutal New Year’s fight that was the first step down the Western & Atlantic RR to Chattanooga. That afternoon we stop at Ferguson Hall, the Tennessee Children’s home in Spring Hill, where Confederate General Earl Van Dorn was murdered for “violating the sanctity” of the home of Dr. James Peters and his beautiful wife, Jessie. When the Union wrested control of the Mississippi River in the west and Robert E. Lee’s army of Northern Virginia was constricted in Petersburg and Richmond, the last mobile Confederate army made a final offensive led by the aggressive John Bell Hood. His army caught up with the Federals under John Schofield at Franklin. Schofield, while attempting to withdraw to Nashville, dug in and repulsed a furious Southern onslaught that resulted in devastating losses to Hood’s Army of Tennessee, including the deaths of six generals. Today, we visit Carnton Plantation, the Lotz House and Carter House, where families huddled in the cellar while the battle raged around them. We begin our day outside of Nashville at Traveller’s Rest, General Hood’s HQ for the Battle of Nashville. Hood had positioned his weakened army of 30,000 just south of the city, where he dared George Thomas’ 55,000 strong Army of the Cumberland to attack. We will see the Peach Orchard and Shy’s Hill where the Confederate flank was turned; then to the initial Confederate line at the Battle of Nashville Memorial. We stop at the Belmont Mansion for lunch. Afterwards we visit the 1897 full-size replica of the Parthenon, which helped give Nashville the appellation, “Athens of the South.” We will end our day with a farewell dinner and musical entertainment on the river in downtown Nashville. Morning transfer to Nashville Airport. Although we do walk numerous battlefields, there is nothing that is overly taxing. Prices are per person based on double occupancy. For a single room add $650. New SAHT experience did not disappoint! Until booking this latest tour and then reading several books on this theatre of Civil War, I knew very little of how strategic these battles were. The loss of life by both armies rivalled the more well known battles such as Gettysburg and Vicksburg – such was the importance of holding the railroads. Our historian Parker Hills detailed the movements of the armies at each stop; his maps make it clear what happened as you look over the landscape and battlefields. I loved everything about this tour – perhaps a highlight for me was being at the top of Lookout Mountain on a misty morning imagining how it would have been with the two armies clashing at the ‘Battle above the Clouds’. All Museums, Mansions and sites extremely interesting, our Hotels exceptional! Thanks to Parker, Mark and Marina for providing a memorable experience sure to become another permanent and popular Civil War Tour.